Deleting Positions is NOT normally recommended once you have started scheduling. When you delete a position, it removes that position label and ALL SHIFTS for that Position on Unpublished future weeks and also removes all those shifts from any templates you have saved. This cannot be undone. Once you choose to delete a Position those shifts cannot be brought back. If you have deleted a position and want to restore it back, you can do so. 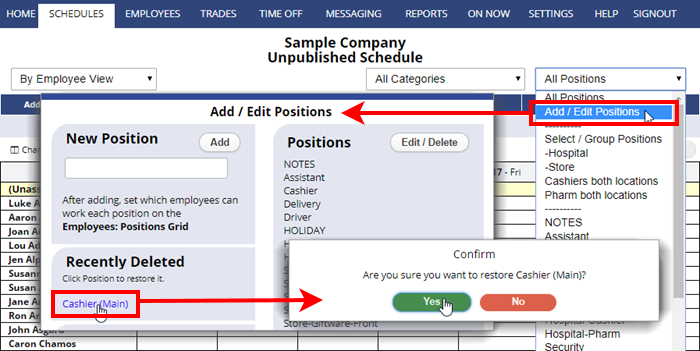 When you restore a position, any shifts on Published weeks will be restored back into your account as will the Employees’ ability to work that position. The position will also show again on all Schedule displays. Note that restoring the position will NOT restore the shifts that were deleted on future unpublished weeks or in templates.